Kenya package holidays are a great way to experience all that Kenya has to offer. From Big-Five safaris, private off-the-beaten path journeys, African culture, relaxing beach holidays to mountain trekking adventures. Kenya has been immortalised as the home of the safari tradition by personalities such as Karen Blixen and Ernest Hemingway and captured beautifully in classic films like Out of Africa and Born Free. Visitors can witness the great wildebeest migration between July and October as over a million wildebeest, zebra and other plain game trek from the Serengeti plains in Tanzania to Kenya’s Masai Mara and back again. Endowed with such a constructive climate – sunny for most of the year and moderately wet, Kenya is a year-round destination. Most Kenya package holidays start in Nairobi, the capital of Kenya and the coastal town of Mombasa. Nairobi receives many flights from the UK, Europe, Asia, Middle East and beyond. The Kenya holiday packages here feature both group tours with fixed departure days and private tours. They can all be easily booked online. Below are some of the popular Kenya safari packages. 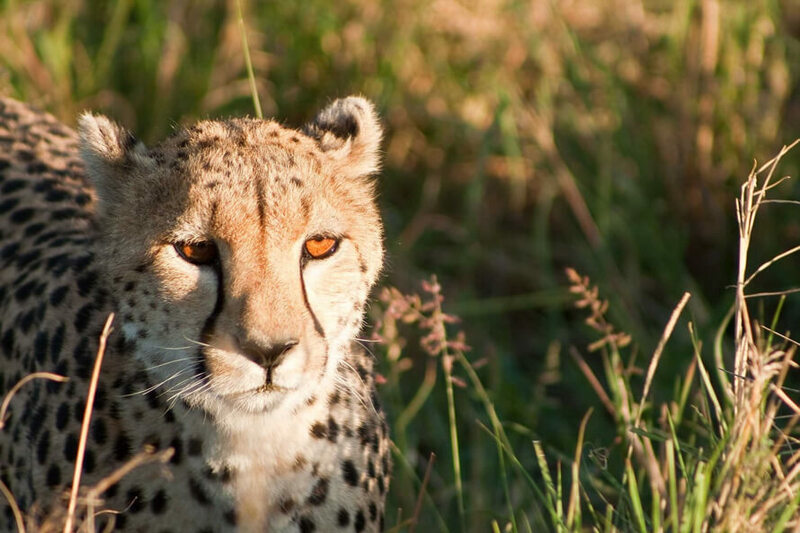 This safari package is ideal for those with limited time. It takes you to Masai Mara, which offers excellent year-round game viewing. The park is also home to the wildebeest migration and more than 560 bird species. Live a real Lion King moment on this 8-day safari package to Kenya’s famous parks. Visit Aberdare National Park and stay at The Ark Lodge, where wild animals come to visit you in the floodlit waterholes, Lake Nakuru National Park, where over a million flamingos and pelicans can be seen and the Masai Mara National Reserve. Among the popular Kenya package holidays, this private safari takes you to Ol Pejeta Conservancy, East Africa’s largest black rhino sanctuary, Lake Nakuru National Park and Masai Mara National Reserve. This Kenya package holiday is popular with families and honeymoon couples. It flies you to your destination considerably reducing travel time. It takes you to Amboseli National Park plus 30,000 acre private wilderness conservancy (meaning you can take night game drives, which are not allowed in National Parks). Amboseli is famed for its huge herds of elephants, numerous plain game and breathtaking views of Mount Kilimanjaro, Africa’s highest mountain. You also get to visit Meru National Park and Masai Mara. Click here for more all-inclusive Kenya package holidays. You can also submit an inquiry for a tailor-made itinerary. If would like to take a Kenya ballon safari, be sure to pre-book. They usually take place in Masai Mara Game Reserve and cost about US$450. The minimum age to take a balloon flight is 7 years. Kenya offers 536 km of pristine white sandy beaches. They are the perfect place for pampering and post-safari relaxation. With average sea temperatures rarely dropping under 26°C the year-round conditions for swimming are magnificent. The tropical beaches on either side of Mombasa offer plenty of opportunity for active pursuits such as diving and windsurfing. Popular beach destinations at the coast include Diani Beach, Watamu and Lamu. 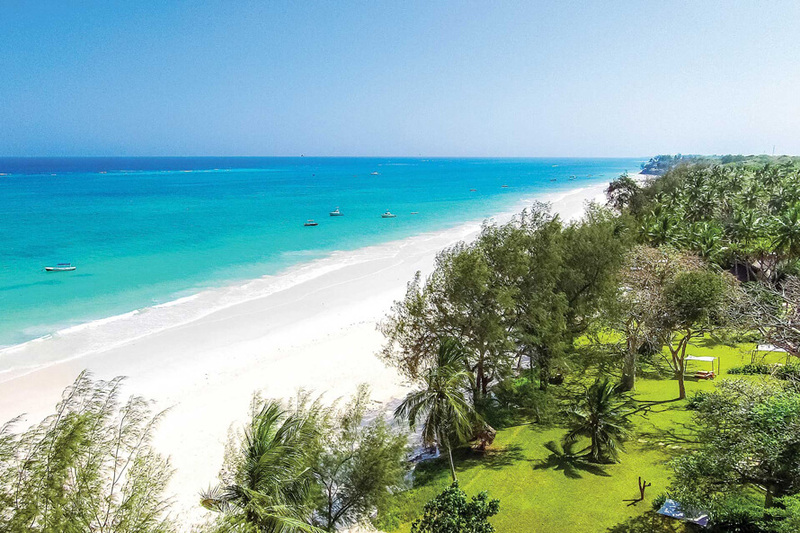 This Kenya beach holiday package takes you to Kenya’s North Coast, a tropical idyll of gentle sea breeze, white sandy beaches and opulent resorts. Activities here include a city tour to Mombasa old town, Fort Jesus, a Portuguese style fort build between 1593 and 1598, visits to Gedi Ruins, a deserted city lost deep in the jungle, Shimba Hills Reserve, Haller Park, volleyball, lawn tennis, water sports etc. Mount Kenya is situated in central Kenya, just south of the equator, about 175 km northeast of Kenya’s capital Nairobi. The mountain’s highest peaks are Batian (5,199 m), Nelion (5,188 m) and Point Lenana (4,985 m). Batian and Nelion require technical climbing skills, whereas anyone who is reasonably fit can reach Point Lenana. The three principal trekking routes are Naro Moru, Chogoria and Sirimon. On the trek up Mount Kenya you are able to see the mountain’s wealth of flora and fauna such as Elephant, Buffalo, Antelope, Colobus Monkey, Augur Buzzard, Tacazze Sunbirds, Verreaux’s Eagle and high altitude plants like groundsel and lobelia. Descend is via Sirimon route that features abundant wildlife and beautiful alpine scenery. On this popular Mount Kenya trekking package ascent is via Chogoria, which is the most scenic and interesting of the 3 trekking routes. The route passes the enchanting Hall Tarns and looks down sheer cliffs into the magnificent Gorges Valley. The Austrian Hut is reached via Tooth Col at the head of the valley. Descend is via Sirimon route. Mount Kilimanjaro is the highest mountain in Africa. It is situated in Northern Tanzania, near the town of Moshi. The mountain is composed of 3 distinct volcanic cones: Kibo (5,895 m), Mawenzi (5,149 m) and Shira (3,962 m). Uhuru Peak is the highest summit on Kibo’s crater rim. The popular Mt. Kilimanjaro climbing routes are Rongai route, Marangu route, Machame route, Umbwe route and Shira route. Except for Marangu route where accommodation is in huts, overnight in all other routes is in camps. This Mount Kilimanjaro package takes you up through Marangu, which is the most popular of the routes up Mt Kilimanjaro. It is relatively easy, but tends to be very busy. The ascent and descent routes are the same and accommodation is in shared huts with other climbers. Machame route is highly recommended and it’s probably the most scenic Mount Kilimanjaro trekking route. With gradual ascent through forest you emerge to see wide views of the moorland on Shira Plateau, Kibo and the Western Breach. Click here, to see all Mount Kilimanjaro trekking tours. Do you have a Kenya travel story you would like to share, click here to share. We thank you and am sure other travellers thank you too.